WASHINGTON — If you consider Bernie Sanders to be the front-runner — or one of the front-runners — in the Democratic race for president, then isn't he underperforming in the early states he easily won or essentially tied back in 2016? A Monmouth poll of Iowa released on Thursday found Sanders in second place with support from 16 percent of likely caucus-goers. That's behind Joe Biden (27 percent), but ahead of Pete Buttigieg (9 percent), Elizabeth Warren (7 percent), Kamala Harris (7 percent) and Beto O'Rourke (6 percent). Reminder: In 2016, Sanders got 49.6 percent in Iowa — almost tying Hillary Clinton's 49.9 percent. A new St. Anselm/New Hampshire Institute of Politics poll also had Sanders at 16 percent in the Granite State. That's behind Biden (23 percent), but ahead of Buttigieg (11 percent), Elizabeth Warren (9 percent), Harris (7 percent) and O'Rourke (6 percent). Answer: There's more attention on Buttigieg in third place at nearly 10 percent in both states, or on Biden leading before he's announced a presidential bid, than on Sanders' pedestrian numbers in states he already won or essentially tied. Ahead of Monday's filing deadline for the first fundraising quarter, there's been a remarkable fundraising development in the Democratic Party over the last 12 years. The Dems' bundler model (whereby candidates race to get maxed-out checks from donors) has been replaced by the ActBlue model (where they hunt for small-dollar donors over the internet). Yet in the first quarter of 2019, the Top 7 Dem candidates so far (Sanders, Harris, O'Rourke, Buttigieg, Warren, Klobuchar, Booker) have raised a combined $63 million. Yet in this first quarter, Sanders had 525,000 donors ($35 average), O'Rourke 163,000 ($58), Buttigieg 159,000 ($44), Harris 138,000 ($87) and Warren 135,000 ($44). So we get the concerns by Democrats that the overall money appears to be down so far - especially when looking ahead to face President Trump in 2020. This weekend, we'll see three different Democratic candidates hold kickoff rallies in their hometowns. 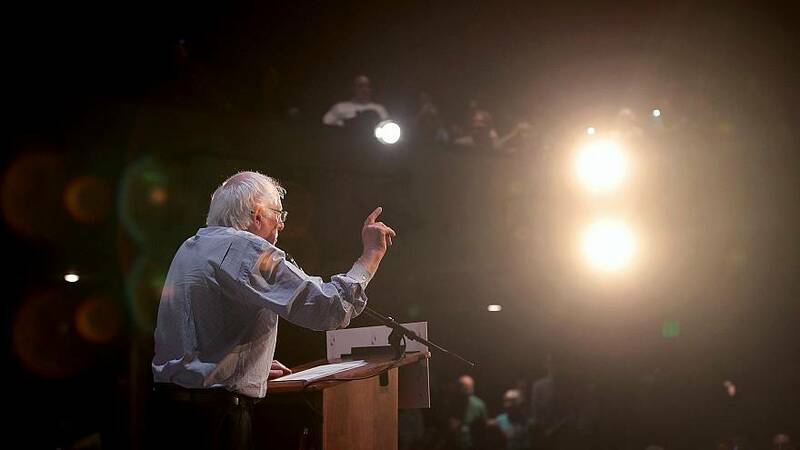 Friday: Amy Klobuchar, Jay Inslee and John Hickenlooper are all in Iowa… Elizabeth Warren stumps in New Hampshire… Beto O'Rourke and Eric Swalwell are in South Carolina… And Bernie Sanders begins his Midwest swing in Wisconsin. Saturday: Cory Booker has his hometown kickoff in Newark… Hickenlooper remains in Iowa… Warren stays in New Hampshire… Ditto O'Rourke in South Carolina… And Bernie Sanders hits Indiana and Michigan. Sunday: Pete Buttigieg has his hometown kickoff in South Bend, Ind… As does Swalwell in Dublin, Calif…. O'Rourke remains in South Carolina… Inslee and John Delany campaign in New Hampshire… And Julian Castro hits Iowa. Don't miss the pod from yesterday, when we did a deep dive into those new Dem polls in Iowa and New Hampshire. That's the share of Americans who say they don't have confidence in the wisdom of the American public when it comes to making political decisions, according to a new Pew Research Center survey. It's not exactly breaking news. Americans' faith in our collective political wisdom has mostly been dropping since at least the mid-1990s. But here's the thing that caught our eye. Before Trump's election, Republicans and Democrats were pretty much aligned in their increasingly pessimistic views about the electorate. But after Trump won, the share of Republicans who said they had faith in the public's political smarts jumped from 35 percent to 54 percent. And now, post-2018 midterms, that's coming back down to Earth — now back to 43 percent. It looks like Herman Cain doesn't have enough support for confirmation to a Fed seat. Trump says he considered his daughter Ivanka to head the World Bank "because she's very good with numbers." A new indictment alleges that Michael Avenatti embezzled millions from a paraplegic client's settlement. Pete Buttigieg and Mike Pence? It's "complicated," the AP writes. Chuck Schumer isn't promising to keep the filibuster in place if Democrats win a Senate majority. Critics are gearing up to challenge a new Ohio 'heartbeat' abortion bill in court. Stacey Abrams says that not beating Trump — but instead "winning America" — is the key to 2020 success. Kamala Harris says she owns a gun "for personal safety." Here's a look at those new polls in Iowa and New Hampshire, via Ben Kamisar.